Dual Chain Double CAM Drive Double Bass Drum Pedal Fast, double CAM action with simple exec.. 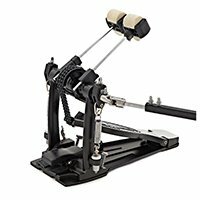 Direct Drive Double Pedal - Direct cam drive for exact smooth feel - Fast-touch G-branded pe..
Gibraltar 4711SC Bass Drum Single Pedal, lightweight, Fast and solid single chain drive, "..
Gibraltar 4711ST Bass Drum Single Pedal, lightweight, Fast and solid strap drive, "Hammer".. Direct Drive Single Bass Drum Pedal - Direct cam drive for exact smooth feel .. Suitable for cajons in standard size Smooth, quiet cable system Adjustable spring tension C.. The Pearl P-932 is a single-chain drive pedal, equipped with a Demon Style Powershifter long-f..